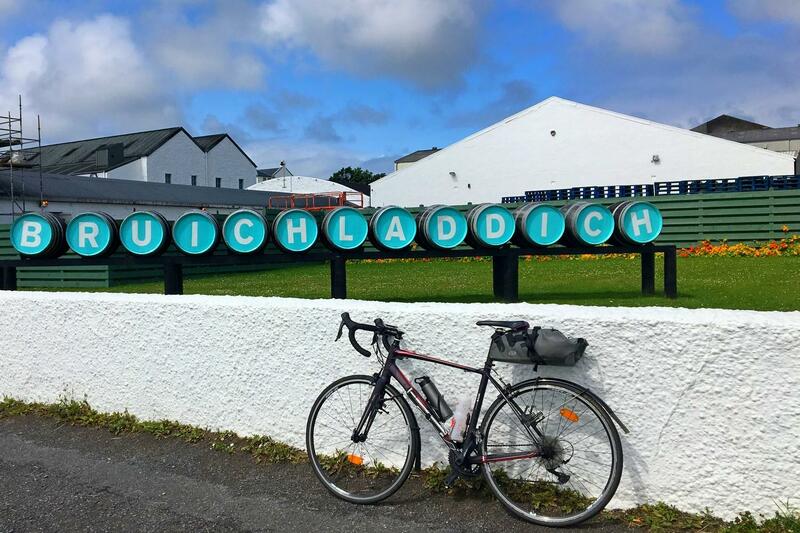 Discover Scotland’s most famous whisky distilleries on this island-hopping cycling holiday, riding across the islands of Arran, Islay and Jura. 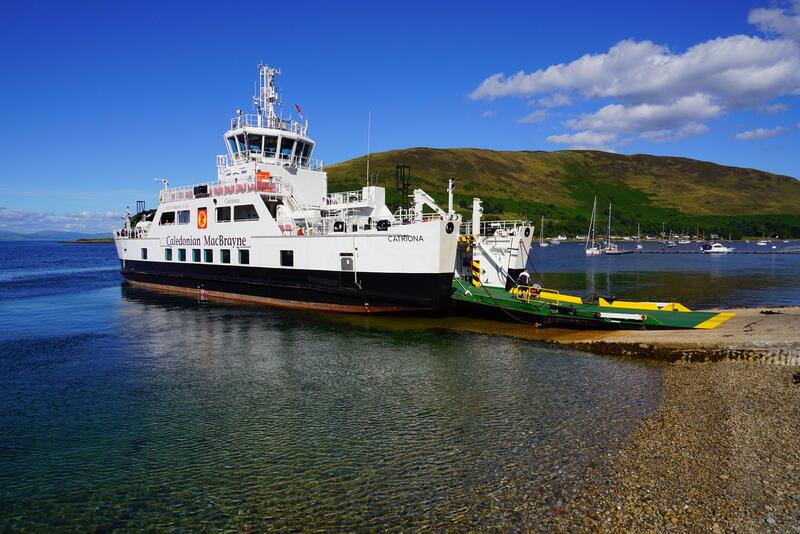 Catching the ferry from mainland Scotland to Arran marks the start of your island-hopping adventure. 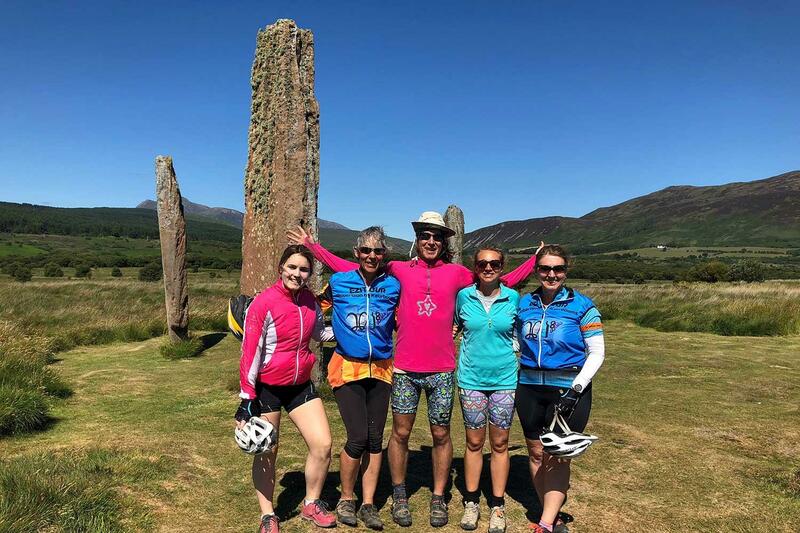 Well known for its stunning scenery ride through a landscape of jagged peaks, rolling hills and rugged coastal roads, Arran craft breweries produce excellent ales, perfect for quenching a cyclists' thirst. 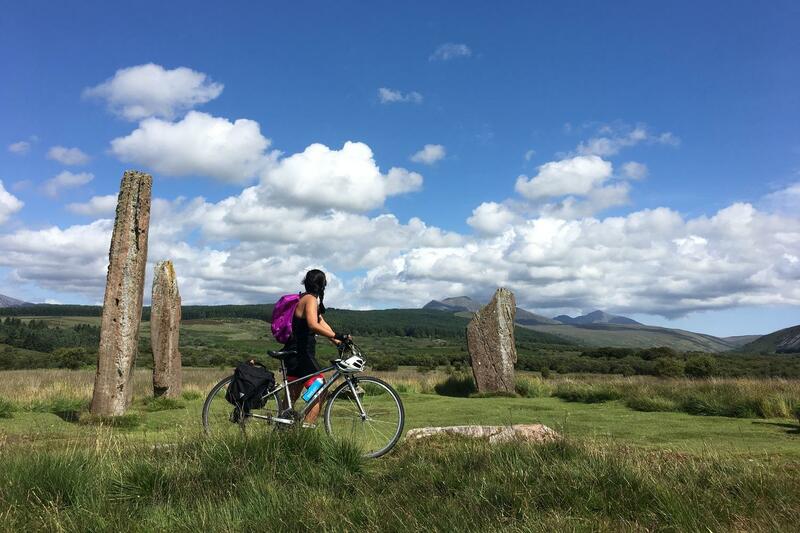 From Arran catch the ferry to Kintyre and pedal across the peninsula to the Isle of Islay. Small whitewashed villages and vast empty beaches make the Isle of Islay a very special place. Home to the world-renowned distilleries of Lagavulin, Laphroig, Bowmore and Bruichladdich, Islay also boasts several smaller, independent distilleries such as Kilchoman that is worth a visit. 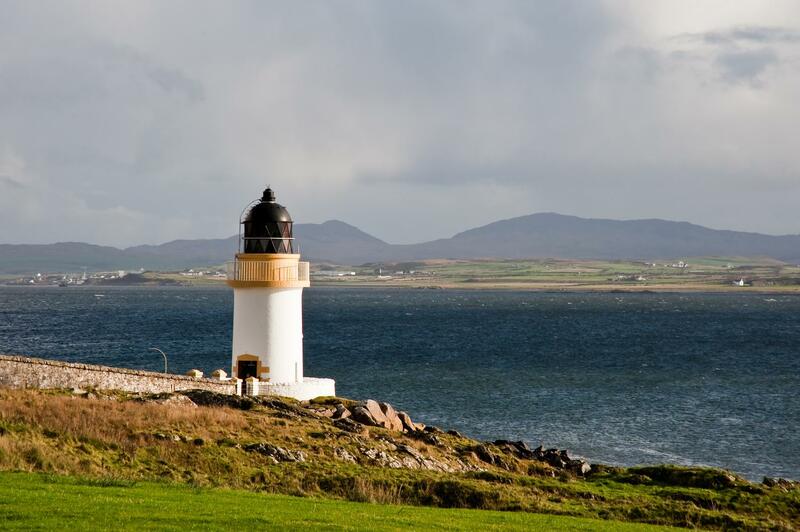 The last island to explore is the remote island of Jura, excellent to spot red deer, explore wild Atlantic coastline and visit the famous Jura distillery. Rounding off each day in cosy, family run B&Bs and inns, enjoy meeting local islanders over a wee dram in the village pub! Day 1: Arrive in Brodick and overnight. Ardrossan is the departure point for the Arran ferry. It is easily reached from Glasgow by train (50 minutes) and has secure parking. You will collect rental bikes from here if required and then jump on the one hour ferry to Arran to begin your adventure. Cycling on the Isle of Arran is a delight. 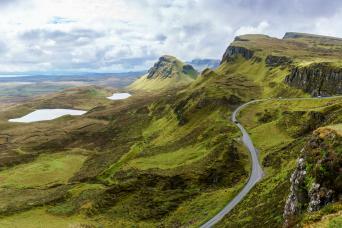 Often described as Scotland in miniature it is just packed full of things to see and do as you pedal the quiet coastal roads which ring the island. You have a choice of routes ranging from 14 to 42 miles. Machrie standing stones are just my absolute favourite place on Arran so don’t miss them. 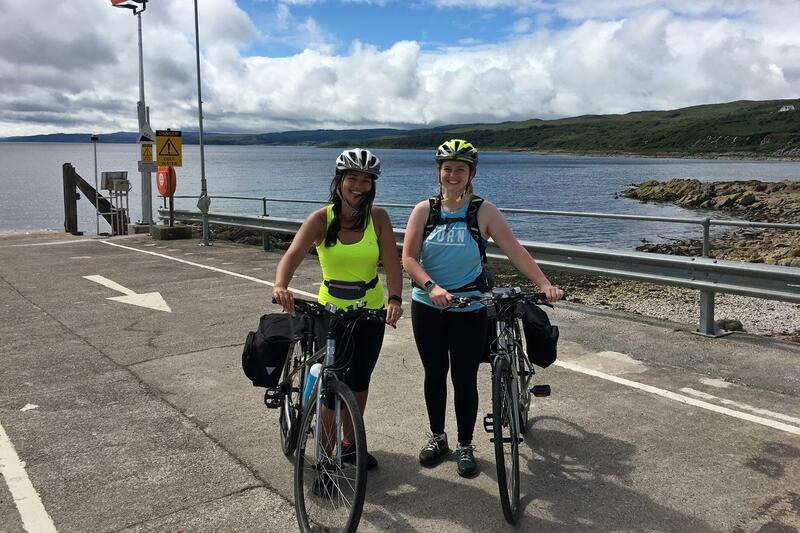 The morning ferry from Lochranza takes you back to the mainland island of Kintyre and it is just a short five mile cycle over to Kennacraig for the 13:00 ferry to Port Askaig on Islay. We suggest a diversion to the Seafood Cabin at Skipness Castle for an early lunch. You just can’t beat fresh locally caught seafood done simply. Keep your camera handy on the two hour ferry to Port Askaig as the views are splendid and dolphins, whales and basking sharks are all regular visitors to the Sound of Jura and Islay. Jura is the wildest and most remote of Scotland’s inhabited islands. It has no direct ferry to the mainland its 200 inhabitants and vastly outnumbered by the island’s 5500 deer. There is no getting lost on Jura, the island’s only road runs up the eastern side of the island and the maximum round trip is 62 miles. The 21 mile round trip to Craighouse Village and the Jura Distillery is a great day out. 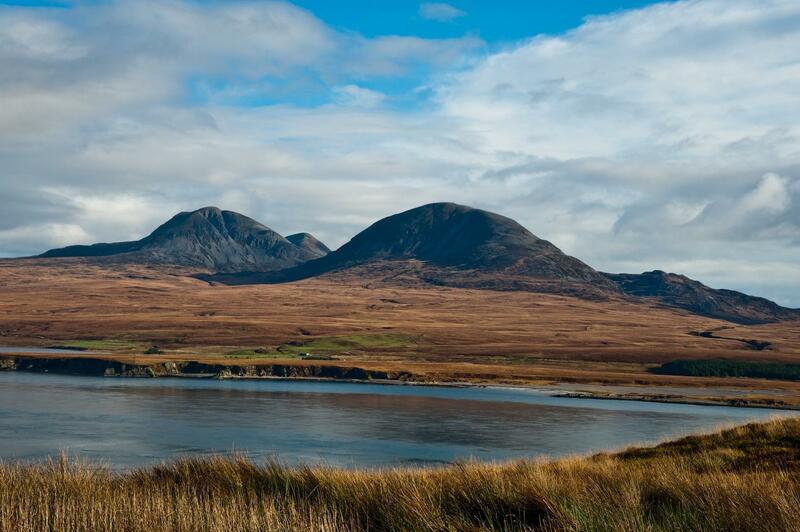 Keen walkers may also wish to pack their boots as a climb of the Pap’s of Jura rewards with panoramic views and red deer sightings are all but guaranteed. A few white sandy bays pierce the steep cliffs of the Atlantic Coast of Islay. Relentlessly pounded by the Atlantic surf this wild coastline is a haven for bird and wildlife and exploring this countryside on quiet singletrack roads is enchanting. The choice of routes is endless and you can cycle for anything between 18 and 60 miles. 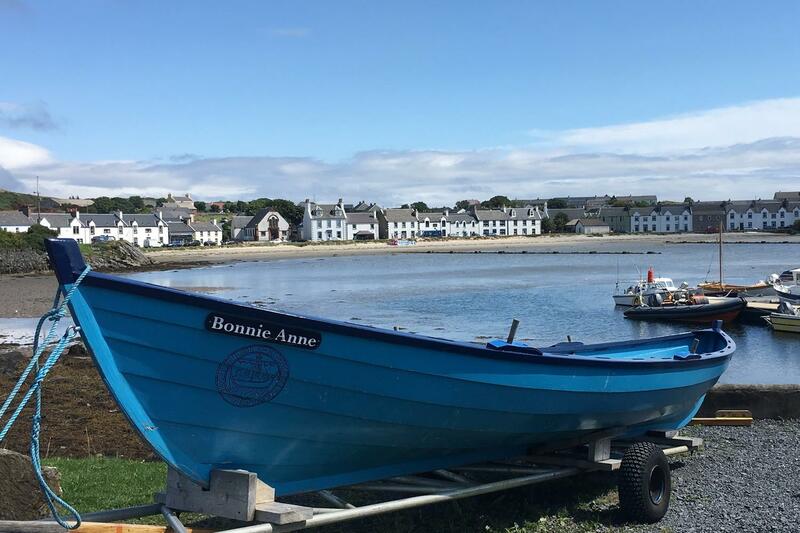 Take the time to explore the Museum of Islay Life, the Islay Natural Heritage Information Centre and just stroll around this charming village before you head off to Bowmore. You are in for a real treat today! Islay’s southern coast is littered with islands, shipwrecks and three of the best distilleries in Scotland. Cycle west from Port Ellen for ten miles until you reach the golden sands of Aros Bay, the perfect spot for a picnic. On your return you can visit Ardbeg, Lagavulin and Ardbeg Distilleries for a complete whisky experience. We search out accommodation of character so that you can enjoy a genuinely warm welcome and authentic Scottish experience. This tour includes a mix of small family run B&Bs and hotels as well as some charming island hotels. All offer a warm welcome to cyclists, have secure bike storage, offer traditional hospitality and delicious local food. When you are cycling between accommodation your main bag will be moved by our local crew. You will have to take your own bag on and off ferries and from your accommodation to the ferry terminal. With this in mind I would suggest you limit your bag to 15kg and personal experience suggest a backpack or pull along is the best option. If you have a long way to travel after the trip I would recommend an extra night in Brodick or Troon on day 8. Port Charlotte is another great spot for an extra night so that you have more time to enjoy the West Coast of Islay. The holiday is available in the months March to October and you can start your holiday on any date in the season. This holiday is available from late March to late October. Spring and Autumn can be colder. May, June, July and August are the best time of year for this holiday. 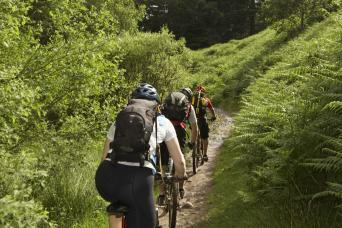 On this tour it is recommended that you bring or hire a mountain bike. As the terrain is very uneven using either a hybrid or road bike is not advised. Although the whole route is on tarmac a mountain bike is still the best option. You will need a helmet, cycling clothes, waterproofs and warm clothes as well as casual clothes for the evenings. Your info pack will have a detailed equipment list. We offer bike hire for this holiday and you can collect and drop off your bikes at your accommodation in Arran. We use excellent quality mountain bikes equipped with a rear pannier rack, repair kit, pump and lock. This trip is not waymarked however you will be supplied with route notes and detailed maps so you should have no problem following the route each day. This trip is graded easy to moderate as you have various choices of route ranging from 20 - 62 miles. You should have a good level of fitness as there are several ascents/descents along the way. The distances and ascent/descents are approximations of the recommended routes. Please be prepared by packing all necessary items, for example, proper rain gear (jacket and pants), sun hat and sunscreen. Your information pack has a detailed equipment list which includes standard cycling gear such as warm and waterproof clothes for the cooler months and lightweight clothing for summer, and a daypack. Ardrossan is 32 miles south west of Glasgow and 18 miles north of Prestwick Airport. From Glasgow trains (50 minutes) and buses (1h15) run regularly. From Prestwick a taxi is the best option and takes about 20 minutes. We strongly recommend taking out travel insurance to cover cancellation or curtailment of your holiday. Travel to / from Ardrossan. Although the average daily distances are not that long there are a couple of longer days and the roads have plenty of up and down so this holiday is better suited to regular cyclists with a reasonable level of futness. Highly recommended cycle holiday on all levels! Macadventure are highly recommended regarding meticulous organisation of this island hopping holiday; buying all necessary ferry tickets; collection of our cycle paniers and punctual delivery; arranging beautiful and often unusual accommodation; keeping us informed and providing us with excellent service despite relatively short notice! They took away all the potential stress of going somewhere unknown to us so that we simply had to turn up, set off and enjoy ourselves. We returned home restored and re-energised thanks to them...alongside some glorious weather as a bonus! Thank you! Nature. Ferry. Water and Whisky. This is my sixt time i am using Macs Adventure for a holliday. 5 on cycle and one hiking , and each travlleing have been a great expirience . The ferry rides to the island of Arran is great with the hills rising up on the island in front of you . Both Brodick and Lochranza. are small and quiet places .The weather was superb on the cycling day . so we decided to go over the hill to Machrie bay , and follow the shoreline to Lochranza . Not recomended on a windy day. Dont miss the deer in Lochranza. We saw them around the castle and on the golf course. The cycle ride over Kintyre peninsula is a much harder climb then it look on the map. The ferry rides to Islay is pure joy. Port Askaig is a very small place and a very old and "picturesque" hotel. We skip the Jura day and spend two nights in Port Charlotte . A beautiful hotel. We have a taste for whisky so we went to Caol Ila , Bunnahabain , Bruichladdich and Kilchoman , before we cylcle to Port Ellen via Bowmore. I recomend a detour to Machir bay to witness the force of the ocean . Remember when you are staying in Port Ellen is only 2 operating reastaurant there at the moment. I will higly recomend a trip to Kildaton cross an Claggain bay. At the kildaton cross was a self service coffe and chocolate cake box , with cup and everything. That made our day ( thanks for the trust in people). We had some issue with the breakdown on one ferry . But Macs Adventure was there for us ,and kept us update on the phone . Great service . I will return for an other adventure next year. Wonderful experience - even without the weather!! Very well organised, with excellent notes and suggestions of routes - thoroughly enjoyed, and so glad we added a few more days to the original itinerary. Weather was not good, but did not stop us from enjoying the landscapes, food, drink, people and ourselves! Highly recommend this to others - even saw some Golden Eagles!! We LOVED this tour. My husband and I are both in our mid 50's and reasonably fit. While the tour was rated easy to moderate we found it leaned very heavily toward the moderate. Most of the terrain was rolling hills, some of them quite challenging (the String Road out of Brodick, the climb out of Kennacraig, the climb out of Lochranza). All accommodations were great. The people were extremely friendly and many times went out of there way to help us. Our luggage transfer worked seamlessly. The route information provided by Macs was accurate but we would have liked a bit more detail. The scenery was beautiful!!!!! Not to be missed is the loop to Portnahaven out of Port Charlotte. Spectacular! Our bikes were rented from the Arran Adventure Company in Brodick. They were Trek FX Series 7.0 hybrid bikes and were in excellent condition. Although we rode on paved roads many of them have a very rough surface and are not suitable for a road bike. They also provided us with a repair kit and panniers. The bikes had a water bottle cage and we brought our own water bottles as they were not supplied. We also each brought a 10L dry bag to use inside the panniers to keep our valuable items, etc. dry in the rain. We brought rain jackets and rain pants, both of which we used. Our tour was in June and the weather was a mix of sun, rain and lots of wind. As other reviewers have mentioned, the timeline on the final day returning to Brodick is very tight. The trip from Lochranza to Brodick to catch the final ferry is a race against time. The climb out of Lochranza is very long and steep and just that portion took us a good 40 minutes. We made the ferry, but just. The ferry tickets are good for a month from the date they're issued so if you miss the ferry there is another one later in the day. 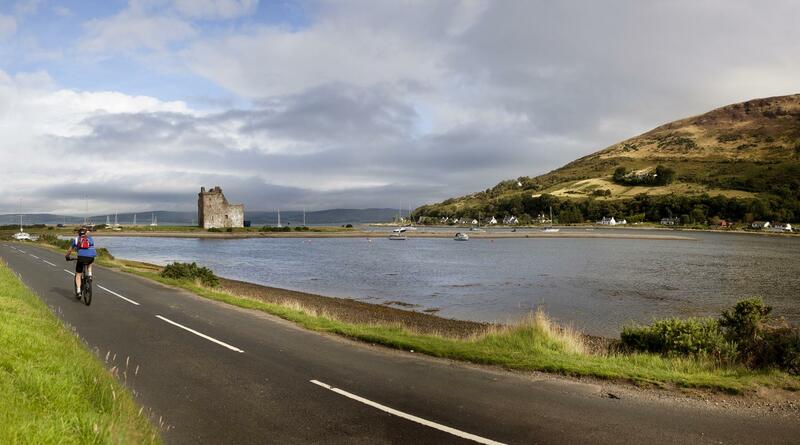 Also you could opt to spend a night in Brodick and take a morning ferry back to Ardrossan. We were able to adapt the holiday to do the cycling we wanted and to include a little mountaineering. Great experience, loved the ferry rides. Island Hopscotch a great cycling adventure! 1. Trip across Kintyre should be rated strenuous, with the extremely long uphill climb. 2. At end of trip, it would be helpful if you could have Arran Adventures meet people at the ferry. It's the end of a longish day, and a long walk from AA to the ferry (or in our case, the Belvedere B&B). 3. Just one error on Mac's part: when we were leaving Port Ellen on the ferry, the bus did NOT pick up our luggage until our B&B host called them. This could have made for major problems. 4. But we had a great time! Especially enjoyed accommodations at Port Charlotte and Port Ellen. We had great fun on island hopscotch tour. The scenery was amazing and we loved catching the ferries from island to island. If you love whisky, you are in luck as there are 8-10 distilleries available along the route. Some of the previous comments were true for us, as well. We struggled a little with the hired bikes. We would have preferred hybrids over mountain bikes. The roads were good enough in all the places we went that a mountain bike wasn't necessary. Some of the accommodation is fairly basic, but everything was clean and comfortable. We had one mishap on our trip, when a part broke on one of our bikes. Macs Adventures handled it promptly and thoroughly, even going the extra mile to call the hotel for that night to make sure we would have a dinner reservation. This was our first cycling tour, but won't be our last. 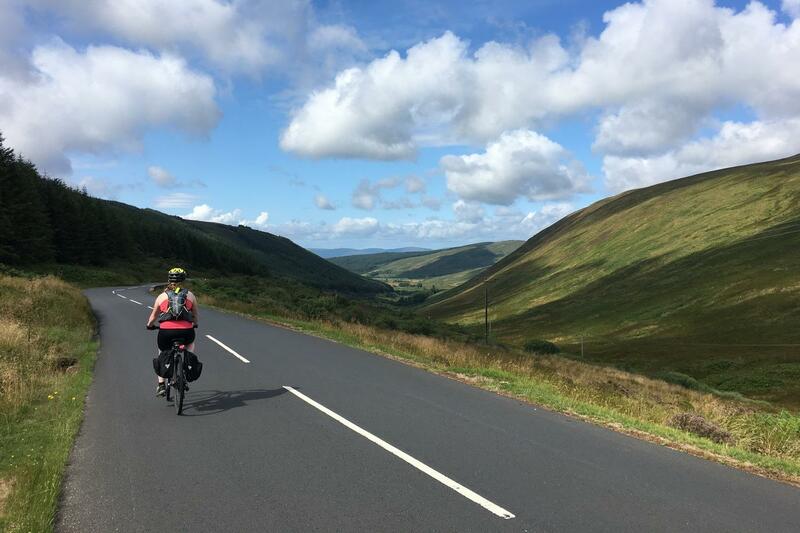 If you want to see a different side of one of the most gorgeous parts of Scotland, like nothing better than the wind in your hair and appreciate the finer things in life then this cycling holiday is hard to beat.